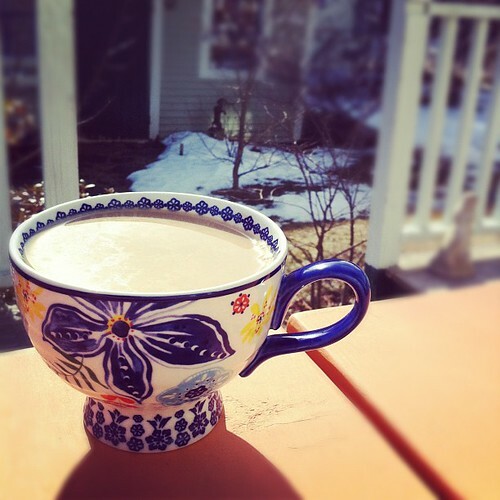 Like last year, in the second week of March, I was able to sit in the sunshine and have my morning coffee on our deck. And like last year, I had thoughts of my daughter's impending birthday, her fifteenth, bouncing around in my head. She begins her Driver's Education classes the day after her birthday, a truth that promises so much change, worry, excitement and celebration. As I sipped my coffee, I chatted with Alex about his work and about our final list for our Fedco order (yes, darling, we can always find room for more trees, surely, I say.) Then, I reminded Alex that today is the tenth anniversary of the closing on our home. Ten years, we've worked on this home, have lived here, loving it, mostly, and we have felt our home loving us back. We still recall that little thrill of excitement, our having fallen in love at first sight, as we both walked, hand in hand, into what would become our living room. Our house is old, it's sometimes a little shabby around the edges and it requires constant work and imagination, but it's so very much loved and cherished by us. When March's brilliance shines through our many windows and the light is with us longer each day, and the garden slowly warms and windows can be opened to let the ocean breeze in, we are reminded of why we fell in love with our home. So I sat, and pondered the last ten years (was I truly not quite 31 when we moved here? ), at the projects we completed, at the changes those years brought. I think of the memories this house contains and pieces of us it has sheltered. I sat and anticipated the work we'll soon be doing in the garden, the slightly, delicious mania of spring, urging us on, the back-to-back spring birthdays we'll celebrate, and I am nothing but grateful for it all. Amy- I had to laugh as I read about your Fedco order. Every year I read with delight as you find room for a few more goodies for the garden. Enjoy these first lovely days of Spring. Aaah welcome Spring. Thanks for inviting us into Casa de Bradstreet, it's always a pleasure. Driver's ed, eh? Have more coffee...lots more. Tameka! It's lovely to see you, I've been bad about making my blog rounds (again). I'm excited for Olivia, she'll be great. Lots of coffee helps get me out the door on time for a 930am class, however, so I'll take it.